If being away from a music system for any length of time is a challenge, this sleek and stylish printed Bluetooth speaker is the solution. The cylindrical speaker has an SD card slot and changes colour and brightness as it plays, with 6 colours in total. It contains a rechargeable Li-Ion 2000 mAh battery, and its output data is 4W. It provides incredible sound for such a small device, and it would make a fantastic choice for a branded item if your customers include campers, outdoor enthusiasts, travellers or anyone else who needs to use a speaker on the go. 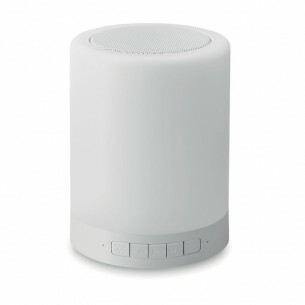 Our touch light bluetooth speakers are made from plastic and comes in white. Our print area includes the front though others may be available. This speaker product is printed in up to 8 colours via pad print, which is a technique suitable for almost all artwork and shapes.